Thomas Antonio Davis, Sr. (born March 22, 1983) is an American football outside linebacker for the Carolina Panthers of the National Football League (NFL). Davis played college football for the University of Georgia, and was recognized as a consensus All-American. He was a first-round pick of the Carolina Panthers in the 2005 NFL Draft. Davis was born in Shellman, Georgia. He attended Randolph-Clay High School in Cuthbert, GA, where he was a four-sport star in football, basketball, baseball and track. In football, he played running back, wide receiver, quarterback, defensive end, defensive back, punter, kicker, and kick returner at various times throughout his career. As a junior, he averaged 30 yards per punt, had two kickoff returns, one punt return, and one fumble return for touchdowns. As a senior, he earned Class AA All-State honorable mention by The Atlanta Journal-Constitution and Georgia Sports Writers Association (GSWA) after rushing for 1,032 yards, leading the region in scoring with 108 points in the regular season. He also played baseball and ran track, where he qualified for the GHSAAA State T&F Championships for the 100-meter dash, placing 6th with a time of 11.1 seconds, and the 400 relay, finishing in 43.98 seconds. In the agility tests, he ran a 4.54-second 40-yard dash, had a 355-pound bench press, 520-pound squat, 324-pound hang clean and 34-inch vertical jump. Davis was regarded by many as one of the finest athletes ever produced by Georgia, but due to the small size of his school, his chances for exposure were relatively low. He was not highly recruited out of high school and was only offered a scholarship to one Division I college, which he accepted. Davis received an athletic scholarship to attend the University of Georgia, where he played for coach Mark Richt's Georgia Bulldogs football team from 2002 to 2004. Following his sophomore season in 2003, he earned second-team All-Southeastern Conference (SEC) honors. He was recognized as a first-team All-SEC selection and a consensus first-team All-American after his junior season in 2004. In 39 career games, he was effective as both a rush linebacker and a free safety, recording 272 tackles, 18 for a loss, 10.5 sacks, three interceptions, six forced fumbles and nine fumble recoveries. He majored in consumer economics. Davis was selected in the first round (14th overall) in the 2005 NFL Draft. Even though he was picked as a safety in the 2005 NFL Draft, he was converted to linebacker during his rookie year. In his debut season he played in 16 games making one start. He made an impact in the December 4 home game against the Atlanta Falcons, when he was used as a quarterback spy to contain Falcons quarterback Michael Vick. Using his speed and benefiting from great play from other members of the defense, Davis helped the Panthers beat the Vick-led Falcons for the first time in franchise history. Vick was held to 171 yards passing and was sacked five times for a loss totaling 36 yards. Davis finished the season with 38 tackles and 1.5 sacks. In the 2006 season, he started in all 14 games that he played in recording 88 tackles and 1.5 sacks. The following season in 2007 he started all 16 games for the first time in his career. He finished the season with 88 tackles and three sacks. In the 2008 season Davis had a career year. He started in all 16 games for the second year in a row, but this time he recorded 113 tackles, 3.5 sacks, and forced 2 fumbles. Davis was placed on the reserve/physically unable to perform list with an injured right knee on October 31, 2010. 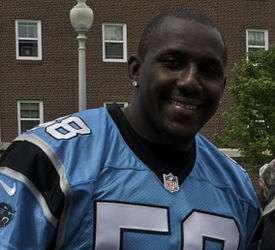 On September 18, 2011, Thomas Davis tore his ACL for the 3rd time in 3 years. No NFL players has ever recovered and returned from three ACL tears. Davis said at the time that he would be the first and hoped to be an inspiration to others. In March 2012, Thomas Davis restructured his contract to save the Panthers approximately $3.8 million in cap space. The Panthers were reported to be tight on cap space going into the 2012 season. Davis played well in the 2012 season, recording 105 tackles, an interception, and 2 forced fumbles in just 12 starts. 2013, however, marked the high point of Davis's career so far. In a startling comeback from three years of injuries, Davis started all 16 games and recorded a career high 123 tackles and 4 sacks, in addition to 2 interceptions and a forced fumble. He was named the NFC Defensive Player of the Month of November and won the NFC Defensive Player of the Week during week 6. He played alongside Chase Blackburn and Luke Kuechly in what quickly became one of the most dominant linebacker corps in the league, a significant part of 2013 Carolina's second-ranked defense. On June 15, 2015, Davis signed a two-year contract extension. Davis continued his outstanding play during the start of the 2015 NFL season, recording 25 tackles, 1 interception, and 1 forced fumble through just the first three games. The next week against the Tampa Bay Buccaneers Davis recorded 11 tackles and 1 interception in a 37-23 victory. During a week 6 victory over the Seattle Seahawks Davis had 8 tackles along with one sack. Davis played very well during the Panthers Sunday Night victory over the Philadelphia Eagles recording a season high 13 tackles. Through the first 15 weeks of the 2015 NFL season, Davis set career highs in sacks (5.5) and interceptions (3). For his efforts, Davis was named to the 2016 Pro Bowl, a rare honor to an outside linebacker in a 4-3 defense. Davis finished the regular season with 105 total tackles, 5.5 sacks, and 4 interceptions. He was named to the AP All-Pro First Team. During the Divisional Round Playoffs, another showdown against Seattle, Davis secured the Panthers win by catching the Seahawks onside kick attempt with 1:12 left in the game, sending the Panthers into the NFC Championship Game. It was Davis' second onside kick recovery of the season, the first coming against the Dallas Cowboys Thanksgiving night game. Davis returned to the NFC Championship game for the first time since his rookie season in 2005, the only active Panther to have played in both Conference Championship games. Davis was knocked out of the Conference win in the second quarter with a broken arm, and finished the game with six tackles. He vowed to return for the Super Bowl and went into surgery early the following morning on the arm to uphold that promise. Davis would play in Super Bowl 50 and recorded 7 tackles, but the Panthers lost 24-10 to the Denver Broncos. According to Pro Football Focus, Davis had the second-highest coverage grade of any linebacker in the NFL behind only teammate, Luke Kuechly. Davis was named the recipient of PFWA's 2016 Good Guy Award. Davis is married to Kelly Davis and has four children. He is an Evangelical Christian. ↑ Horner, Tyler. "Carolina Panthers Free Agency: Tracking 2012 Signings, Targets and Rumors". Bleacher Report. Retrieved 13 April 2012. ↑ Wesseling, Chris (June 15, 2015). "Thomas Davis, Panthers reach two-year extension". NFL.com. Retrieved January 18, 2016. ↑ "At Home with Thomas Davis and family". 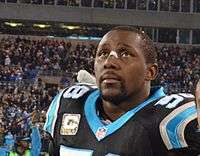 ↑ "Chosen: Carolina linebacker Thomas Davis is making the most of his time on, off the field". ↑ "Panthers Linebacker Wins Bart Starr Award: Christ Is My Leader".